Plano West running out of the tunnel last Friday against Plano East. 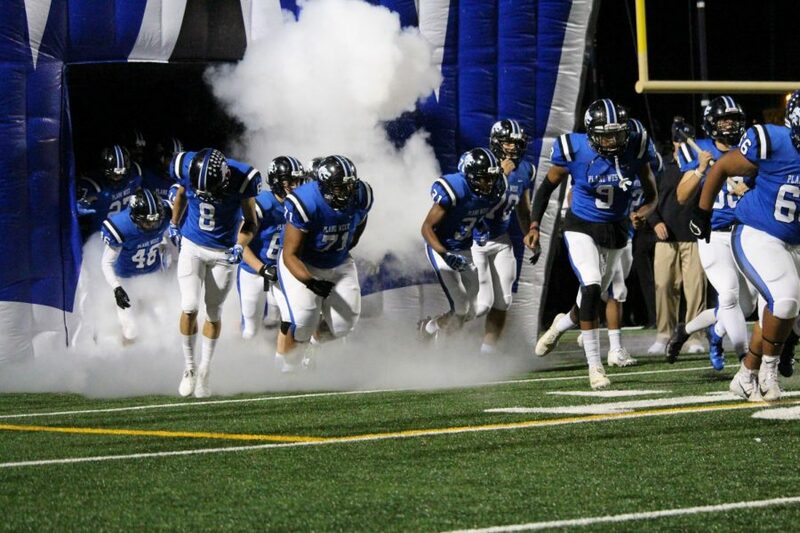 Plano West ended their season with a 63-7 loss last night at Eagle Stadium against Allen, the number one team in the state. Wolves’ QB Will Cannon threw for 92 yards and one interception on nine completions. Canon also rushed for 61 yards on 15 carries. Senior RB Noah Scroggins led all players in the game with a new career-high 164 career rushing yards and one touchdown on 21 rushes. Scroggins’ touchdown was a 77-yard run with less than a minute remaining in the game. Senior Nick Griffin ran for 25 yards on five carries. Junior Cole Carter led the Wolves in receiving with 45 yards on two receptions, and Tavarius Garland followed with 35 yards on four receptions. Plano West had four turnovers, with two of them coming in the first several minutes of the game. The first was a fumble off a broken hand-off play, and Allen ended up scoring one play later. The second turnover was on the following kick-off, where Allen picked up a muffed return in their red zone and scored a play later. The third turnover was an interception that came right before the end of the first half. The fourth was a fumble that came on the 7th play of the fourth quarter. Lots of players on Allen’s offense saw action last night, as most of the Eagles’ starters rode the pine since their playoffs will begin next week. Backup QB Raylen Sharpe filled in for Grant Tisdale at the helm and threw for 148 yards and one touchdown on seven completions. Sharpe also led the Eagles’ in rushing yards with 82 yards and three rushing touchdowns. Tisdale did start the game and threw for 75 yards and a touchdown. on three completions. Running backs Justin Hall and Celdon Manning followed Sharpe in rushing with 62 and 59 rushing yards, respectively. Hall also rushed for a touchdown, and RB Grant Robinson rushed for 43 yards and two touchdowns. Ja’Juan Mason led Allen in receiving yards with 79 and a touchdown, and Bryson Green also found the end zone. WR Blaine Green recorded 64 receiving yards on four receptions. With Thursday night’s loss, Plano West extends their losing streak to 26 games, with their last win coming in the 2016 season in week four against McKinney.